It’s not uncommon for garage roofs to be made from materials containing Asbestos. 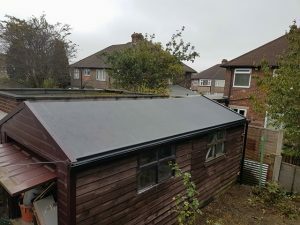 We are experts in removing and replacing these roofs with our weather-resistant, cost-effective and safer EPDM rubber flat roof. 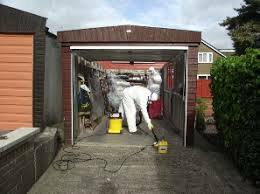 Whether your garage has a leak, is corrugated or not, we’ll ensure the Asbestos is safely disposed of and that your garage is restored. Flat Roof Experts are known throughout Yorkshire as a trusted high-quality roofing solutions company. We promise a structured approach to removal. We’ll firstly inspect and analyse your garage roof. 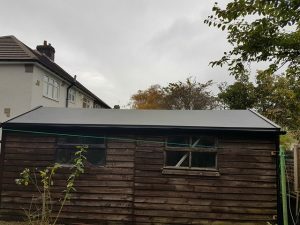 We’ll also provide you with a fixed cost for abstraction and the replacement EPDM rubber roof, which has a 20-year guarantee. We’ll then commence Asbestos removal, which involves spraying PVA water on the contaminated area and enclosing the hazardous materials in polythene sheeting. The garage and surrounding area is then decontaminated with a Category H vacuum and you’ll receive a consignment note as proof. We’ll ensure safe disposal of your garage roof too. •	Prevention of serious medical conditions, some of which currently have no cure. •	Prevention of airborne Asbestos in cases of floods, fires or other natural disasters. 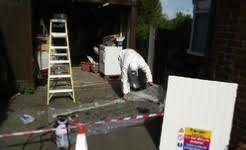 •	Prevention of Asbestos spreading to other areas of the home. •	Durability due to wind, water and UV Rays unaltering strength. •	Clever design, expanding and contracting with changes in temperature. • Cost-effective and requires little to no maintenance. For nearly 20 years, we’ve been providing Yorkshire with high quality roofing solutions. We have built up a reputable business that caters to the specific and unique needs of our clients and we’ve always had the expertise to deliver. We are a family-run business, putting emphasis on values such as good service, effective materials and customer satisfaction. This is reflected by our greatly appreciated 9.9 rating on Checkatrade and we’ll continue to do our best. We’ve also developed wonderful working relationships with our customers, clients, surveyors and installers. To find out more about our Asbestos Roof Removal and Replacement services, give us a call on 01274 737 828 and one of our helpful and knowledgeable team members will be happy to answer your questions. at Flat Roof Experts please contact us using the details below and one of our experienced staff will be happy to help. Copyright © 2018 Alvadac Ltd T/A Flat Roof Experts, Registered in England No 3543660 VAT 816 9770 90. All Rights Reserved.